If you’ve stayed at a hotel, rented a car or bought groceries sometime in the last year, you’ve probably received a customer satisfaction survey. For-profit businesses understand that in order to retain customers, they need to continuously collect and act on feedback. Unfortunately, the nonprofit sector’s equivalent – donor surveys – are not as ubiquitous. How do you participate in conservation? Getting to know a new donor personally (their values and beliefs, why they care about your cause, etc.) might be the most impactful strategy for combating abysmal first-time donor retention rates (18%-23%). Not only do you show the donor that you care, but you can craft a communication strategy around their answer (all with the goal of getting a second gift). 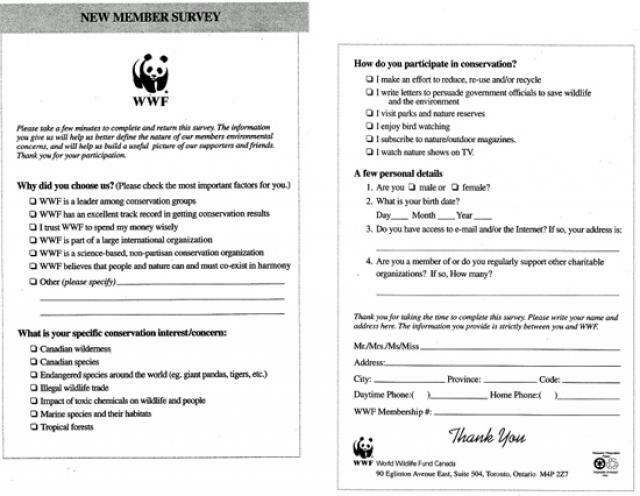 This survey from charity: water differs from the WWF survey in that, instead of focusing on getting to know the donor, it focuses on the communication experience of the donor. How would you rate your experience receiving an e-mail update on your donation from charity: water? Favorite or least favorite part? How likely are you to donate to charity: water again? Because charity: water communicates so frequently with donors (through water well project updates and other stewardship content) it makes sense that they would solicit feedback from donors as to how they are enjoying that content. Knowing who is least likely and most likely to donate again is very helpful in either adjusting or validating ongoing communications. Our friend Pamela Grow brought this lapsed donor survey from Ontario Nature to our attention. This survey is page 4 of a 4-page re-engagement letter created by the geniuses at Agents of Good. What matters to you? This is your space to tell us what you think and feel about Ontario Nature and you. We promise to listen to you and follow up with you if you wish. Whatever you choose, make sure you do segment the survey recipients by interaction recency, frequency and type. It will give you deeper insights and illustrate to the donor that you know what kind of constituent they are. For practical help crafting an effective survey, as well as what not to do, check out these two articles from DonorVoice. For more question ideas, check out this list of 23 questions you can ask in a donor survey (just don’t ask all 23!). Does your nonprofit survey donors? If so, share your favorite questions below! Hi, do you have any recommendations for a delivery system for the donor surveys?